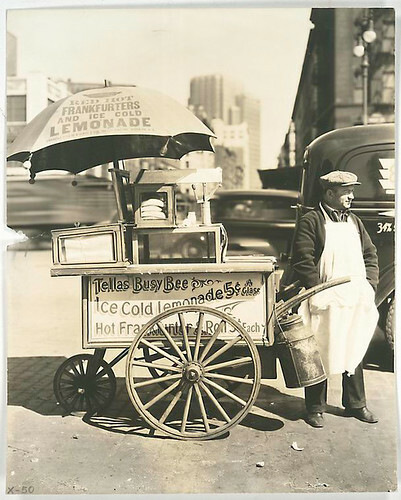 The hotdog cart has a long and storied history in the United States, and DC is no exception to the hotdog cart culture. In fact, DC’s own epic street meat, the Half-Smoke, is part of that culture of hotdog carts in DC. Sadly, most of the standard vendor carts lack any sort of character, and most are pretty common denominator when it comes to the hotdog. Sure, other cities have their own special version of the hotdog, but when it comes to the basic hotdog, DC is pretty much a plain jane. While the increase in mobile food operations in DC is certainly welcome, not one of the new kids has tried to take the hotdog to the heights that it deserves. Not one of them could hold a candle to Beez Neez in Portland, which is saddening. Bring me a gourmet hotdog cart, DC! Avoid the carts on the Mall. Seriously, they’re overpriced by 30-50%, and I don’t think you get nearly as good a product as you would at one of the Sabrett stands. You’re about to have a hotdog, so walk the extra block, okay? Know your onions. There are two kinds of onions you can get on your dog, and there’s a dramatic difference. Do you want sweet and tangy? Go with the cooked onion relish, which, when combined with mustard, gives you an incredible flavor combo that you should try just once. There’s also raw onions, which are usually purple, and not as violent as the chopped raw white onions. Get the half-smoke. You’re in DC. You’re a big kid now. Get the half-smoke, not the hotdog. It’s what Lauren Bacall or Sam Peckinpah would do. Just also get a Tums roll from the cart, too. While it’s not in DC proper, there’s a cart out in Ashburn, VA called Windy City Red Hots that serves up a very authentic Chicago-style hot dog (and more). It’s a hike out there (tip: it’s on the way to the Leesburg Corner outlets), but well worth it. The guy told me he has the poppyseed buns and Vienna beef dogs shipped in directly from Chicago. Just stay away from the non-Sabrett stands. There are some awful hot dog carts out there.